One of the beliefs of a certain Alfred Vogel was that you are what you eat. A belief with a grain of truth, if you ask me. That’s why Alfred Vogel, a Swiss specialist in Medicinal plants, started with his own company specialized in services relating to natural health. This includes plant-based remedies, nutritional ingredients and nutritional supplements from the umbrella brand A.Vogel, which are manufactured by Bioforce AG. 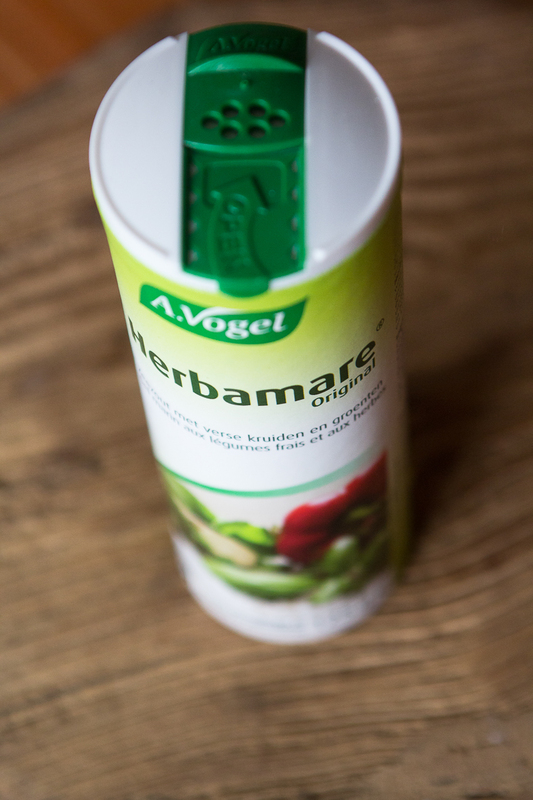 Mister Vogel experimented further with herbal remedies, and made the discovery that fresh herbs were much more efficient than dried ones. Enchante, an office in Ghent, asked me if I wanted to try and taste a special kind of Vogels salt. Herbamare Original Herb seasoning salt is a mix of salt and 14 different fresh organically cultivated vegetables, herbs and spices. The different vegetables and herbs, all from the Elzas, are celery, leek, cress, onion, chives, parsley, lovage, pepper, horseradish, garlic, basil, marjoram, rosemary, thyme. The salt is from the South-French region, the Camargue. It is made according to the recipe of A. Vogel. The herbs are infused into the sea salt, so unlike other seasoning salts this is not a blend of dry herbs – the flavor is inside the sea salt crystals. A little goes a long way, so you’ll need to use less than you would for table salt on your foods and it’s Gluten Free. Enough about the story of Vogel and his salt. Enchante asked me to cook with the salt. What did I cook with Herbamare? I cooked two things. First I made a little appetizer with cucumber, Greek yoghurt and Belgian shrimps. 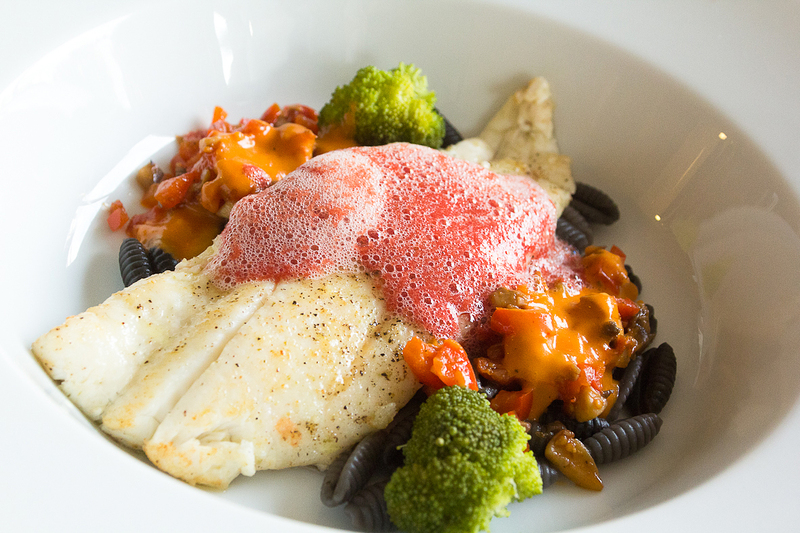 The second dish was the main dish with black pasta, tomato and plaice. Both dishes are an experiment. I experimented with Herbamare and also with Xantan gum. This gum allows you to thicken soups, sauces and creams using only a very small amount of product, and without changing the flavour of your recipe. I used it for the first time in the cooking course, but never tried it at home. The first time is always a bit difficult. That’s why I’m not 100% satisfied with these dishes. The taste was, thanks to Herbamare very good, but the texture and presentation could be better. If you would have some advice about the use of Xantan gum, let me know. Practice makes perfect, remember. What do you do? Slice half of the cucumber in brunoise. Mix with chopped mint and pepper. Blend the other half of the cucumber. Strain it and mix it with a gram or two of the Xantan gum. Add a bit of pepper and the tasty Herbamare salt. Mix the Greek Yoghurt with the olive oil. 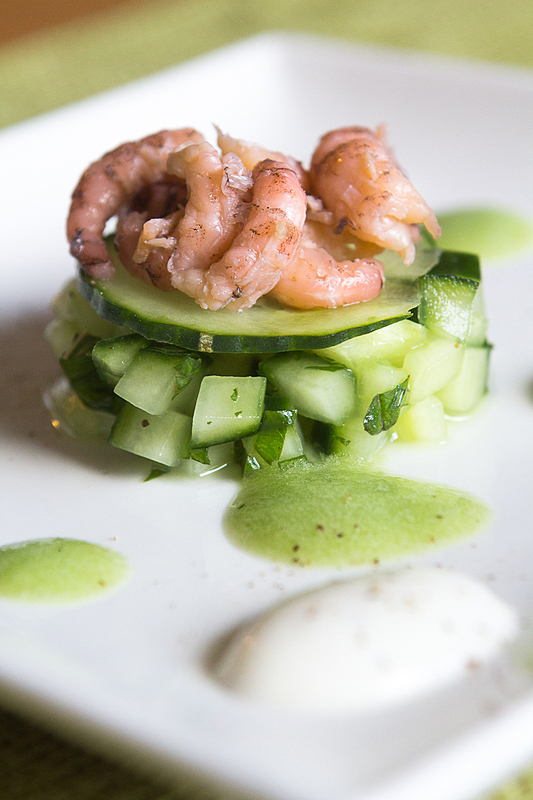 Make a little tower of the cucumber brunoise and the shrimps. Finish with the yoghurt and the cucumber sauce. What do you do? Clean the broccoli. Steam it. Put aside. Preheat the oven on 175°C. Put the cherry tomatoes with the thyme and the garlic, topped with olive oil and pepper in the oven for about 15 minutes. Chop the red pepper and the sun dried tomatoes. Fry the red pepper in a bit of oil. Add the sun dried tomatoes, stir well. Put aside. In the meanwhile, don’t forget to cook your pasta. Heat the tomato juice. When the cherry tomatoes have burst, blend them with a bit of Xantan gum. You will see that it thickens and you get a sauce. Fry the plaices in a bit of olive oil and spice the plaice with the Herbamare salt and a bit of pepper. Normally your tomato juice is hot right now. Add lecithine and mix it with an hand blender. You will see that you get foam. Take a deep plate. First add the pasta, the red pepper, the broccoli and the tomato sauce. Place the plaice on top and finish with a Tbsp of tomato foam. Enjoy your meal! And just one note about the Herbamare Original Herb seasoning salt. It goes perfect with fish. It’s true that it’s tasteful and ou really don’t need a lot of it. A great herb salt, if you ask me. Thanks to Enchante for giving me this opportunity.